St. Peter’s Roman Catholic church began out of necessity. Many of the parish’s members had to travel 15 to 20 miles between 1907-1909 to attend Spring Lake church, before St. Peter’s parish was build. In 1909, the first nave and sanctuary were built. In 1916, a tower was added at the end of the nave to house the church’s bell. This construction was completed by Joseph Schulte. On October 22nd, 1911, the plot was laid for the cemetery. On March 1st, 1925, a meeting was held which began talks on the building of a new church as it became apparent that the current one was too small. On February 12th, 1927, Rev. M.J. Schnitzler of St. Peter’s parish received a letter from the Archbishop of Edmonton giving permission for the new church to be built. Barney Schares was hired as foreman. Mike Schares oversaw the interior furnishings. Both men were from the Wanda district. Mass was held in the basement of the church while it was being constructed. The new church was frame construction and built to Modern Gothlic style. It had “a Cathedral-like front bordered on either side by partly projecting twin towers of octagonal spires. The large front platform, including the dozen wide steps, is of cement. The whole frame structure rests on a full-size concrete basement five feet above the surface. The main body of the church is 70 x 38 feet. The towers measure 10 x 10 feet. The sanctuary is 24 x 20 feet, with a semi-octagonal rear. The sacristy, 16 x 20 feet, is on the South side of and adjacent to the sanctuary. The interior has no columns to mar the vision. There is a double flight gallery, the upper is enclosed by a paneled railing for the choir and the lower affords seating space. The lower front of the gallery is closed in and is a nicely paneled apse. All the ceilings and walls are plastered. All the window and door frames are trimmed by three three wedge keys. The sanctuary has a raised floor of two steps, all green carpet (red presently). 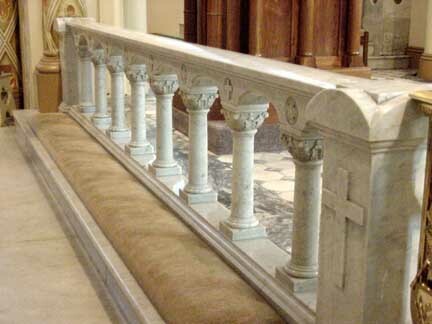 A beautiful marble imitation Communion railing adorns the lower step. In the sanctuary, another three steps mount to the main altar which is of a rich Gothic in Regalice. The front of the mensa (the altar’s table top) bears the scene of the Last Supper. The mensa and the baldachin over the tabernacle are supported by marble pillars. The church is well built throughout and pleasantly painted.” (taken from The Western Catholic, dated August 18th, 1927, see St. Peter’s Church “Through the Years” 1909-1976 for more). The church is significant for its Romanesque Revival architectural design. This is visible in its rounded arch windows with tracery, the rose window at the nave end, the arched coloured glass transom, the niche with statue, and the matching towers with steeples. Features of note of this style inside the church include: the vaulted ceiling, the semi-circular apse, the trim on the windows, doors and baseboards, the arcaded alter rails, and the wood-finished balcony. Sunday, August 8th, 1927 was an eventful day for parishoners of St. Peter’s. Over one thousands people gathered from across the region to witness the blessing of the new church. The blessing was completed by His Grace Henry Joseph O’Leary, Archbishop of Edmonton. For many years, it was customary for the women, children, and girls to site on the left side of the aisle while the men and boys sat on the right. The young bachelors in the parish were seated in the gallery. This changed for a time when Father Schnitzler rented the pews to families for $1.00/small pew and $2.00/large pew. In 1975, the church was shingled with asphalt shingles by Rose City Builders Ltd. In the same year, a lightning strike hit the North bell tower. In 1976, many repairs where completed including cement work, sheeting inside the furnace room, installation of wall paneling and fire extinguishers, and improved lighting. A natural gas furnance was installed in 1986. In 1988, the church received Historical Resource Designation from the Province of Alberta. Cedar shingles were put back on in 1991. In 1999, the exterior of the church was painted. In 2009, wrought iron fencing was installed around eastern the cemetery. In 2012, the remainder of the wrought iron fencing was installed along the northern side of the cemetery. The church was also designated a Municipal Historic Resource with Flagstaff County on July 17, 2013. In 2015, the entirety of the church’s exterior was painted white. Catholic Women’s League. St. Peter’s Church “Through the Years” 1909-1976. 1st ed. Sedgewick, The Community Press, 1976. Print. Giedemann, Louise. Personal communication. 26 Jul 2018. This frame shows the eastern face and southern side of the church. This frame shows the southern side of the church. Note the six over nine paned windows and the rounded arch windows with tracery and coloured glass. This frame shows some of the oldest graves in the cemetery. These are positioned in the south-western corner of the cemetery. Many of these graves are in this area because of Catholic rules determining where unbaptized children and suicidal deaths may be placed. This frame shows a memorial in the middle of the main cemetery. This frame shows the southern side of the church. This frame shows the southern and western sides of the two spires on the eastern side of the church. Each tower has a belfry and an octagonal steeple. Note the gable parapets on each side of each tower. This frame shows the southern side and western end of the church. This frame is a close-up of the door leading out of the kitchen in the basement of the church. This frame shows the western end and part of the northern side of the church. This frame shows the western end and northern side of the church. This frame shows the northern side of the church. Note the six buttresses which protrude from the northern side of the church’s basement. This frame shows the northern side and eastern face of the church. Crosses atop metal balls on each steeple. This frame shows the eastern face of the church. Note the statue inside the niche above the coloured glass rose window. This frame shows the church’s eastern entry-way. Note the double font doors with arched coloured glass transom window. This frame shows the first room off of the eastern entry way. This room is in the north-eastern corner of the church. This frame shows inside of the north-eastern room. This frame shows the staircase to the upper balcony and to the basement in the south-eastern corner of the church. This frame shows the pews inside the nave of the church. Note the apse in the western face of the church (paint blue in this frame). In this church, the chancel (or part of the church near the altar) is carpeted. This frame shows the altar from the east. Note parts of the red carpet. This frame shows the altar from the south-east. This frame shows a bell at the entry to the church’s sacristy. This door is on the south side of the church (as norms dictate) and is also called the priest’s door. This frame shows the inside of the sacristy. This frame shows one of the church’s many antiques. This is an offering stand for votive candles. This frame shows the nave and altar from the gallery section of the church. This frame shows the seating in the balcony of the church. This frame shows the basement of the church. This frame shows the provincial seal designating the church as a Registered Historic Resource. “St. Peter’s School District”. Wagon Trails in the Sod: A History of Heisler and Area. 1st ed. Heisler: Heisler Historical Society, 1982. Print. Giedemann, Leona (Lenhart). “Giedemann, John”. Wagon Trails in the Sod: A History of Heisler and Area. 1st ed. Heisler: Heisler Historical Society, 1982. Print. “St. Peter’s Church”. Lanterns on the Prairie: Strome Diamond Jubilee 1905-1980. 1st ed. Strome: Strome Senior Citizens Club, 1980. Print.